Motorcycle Adventure Ride | One ride at a time. Since the trip was long and there wasn’t much left to see, I took the highway back home, so not much to report. Here is a summary of the final 3 days. Rode through the Badlands, it was hot and amazing. The following day I rode until about 4pm, and I was getting really tired. I saw a sign for the Spam museum so I took a chance and stopped. It was actually a lot more interesting than I would have thought, and everyone was super-friendly there! If you’re near there in Austin, Minnesota, it’s worth a stop. The final day and I made it home! Today wasn’t so much about miles as it was about seeing some stuff. My day started a little later than planned due to an alarm setting issue. Oops! Not a big deal,i actually woke up about a half-hour later than I planed. I had breakfast at the hotel, then charted out my route for the day using my free tourist map that I picked up yesterday. 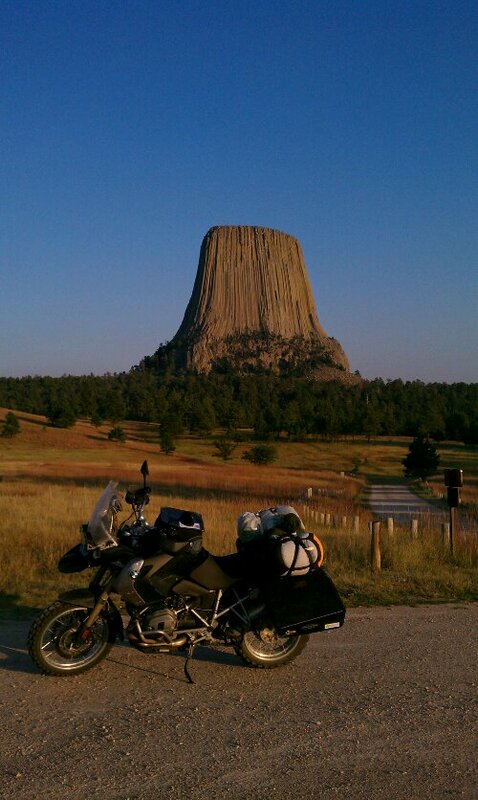 I decided to head back toward Devils Tower to get one last look and to stop at the gift shop and get a sticker for the motorcycle! 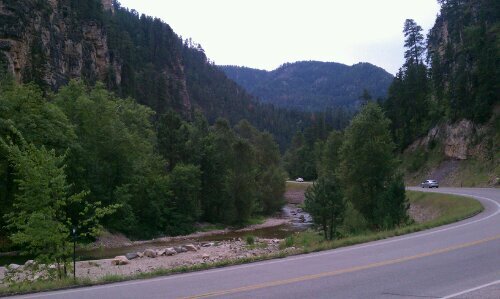 After that stop I got back onto 14 to 90 to get to Spearfish, South Dakota so I could drive the Spearfish Canyon Scenic Byway. It was a nice ride, but nothing like I’d seen on previous days. The speed limit was 35, and even keeping near that speed was enough to run into even slower traffic, so I just rode slowly and enjoyed the scenery. I’d planed to stop at the Broken Boot Gold Mine for some touristy fun, but despite their brochure claiming “open until mid-September” there was a sign that said they were closed after Labor Day, so I moved on toward Deadwood. I enjoyed the HBO series and wanted to see some of the things it was based on, but not enough to pay to look at the cemetary, and the rest of the old buildings seemed uninteresting and filled with casinos, so I moved on. My next plan was to stop at the Sturgis BMW motorcycle dealership and get a t-shirt, which they actually had, so at least that wasn’t a disappointment. The people there were really friendly and helpful, and one of them gave me route advice to my next stop, and a lunch recommendation. I left the dealership and had a cheesesteak at Rosco’z (the z is supposed to be a backwards s I think). After lunch I rode the Vanocker Canyon to Nemo Road, headed south to Johnson Siding, west a bit on 44 to 385 south, then 16/16a through Keystone to Mount Rushmore. 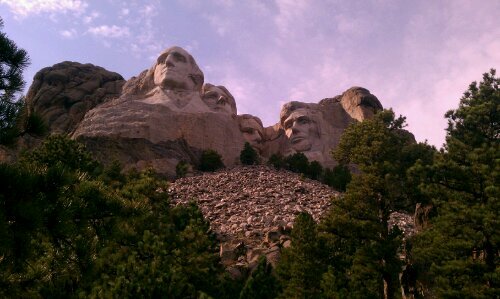 I didn’t really expect much from Mount Rushmore, but it was actually interesting. I did a short guided ranger walk, the ranger was very knowledgable and funny, which made the tour enjoyable for me. After the tour I finished the walking loop through the artists studio and checked out some of the exhibits before heading out. I learned some interesting things today! I drove back to Keystone and found a room for the night. Today was a “bad choice” day I think. Not that anything turned out poorly, but I think it was more tiring than it should have been. Packing up the bike was much easier today; I’d taken everything off and into the hotel the night before, but knowing where things went made it much faster. I ate breakfast at the hotel and got rolling right around 8am. Temperature about 53. I went east on 308 which was a nice, curvy road that ran past an abandoned mine, the site of the Smith Mine disaster in 1943. From there I went through Belfry (school mascot the Bats, of course!) A short run northeast on 72 to Bridger, then a turn southeast on 310 to Lovell, Wyoming. Then I picked up 14a toward Burgess Junction. All smooth so far. 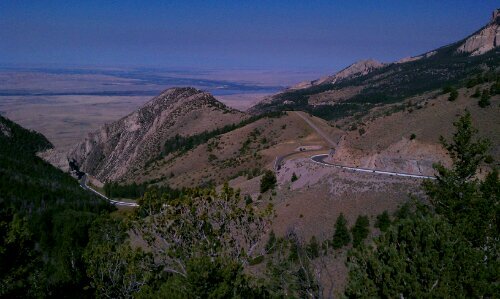 14a is another of those awesome switchback climbing roads with incredible views! I was amazed at my luck, since I only chose that route because it was where I wanted to go! So I’m riding along, having a great time, estimated to arrive at my goal location around 2:30pm, plenty early to catch up the blog, or even continue on if I felt good. 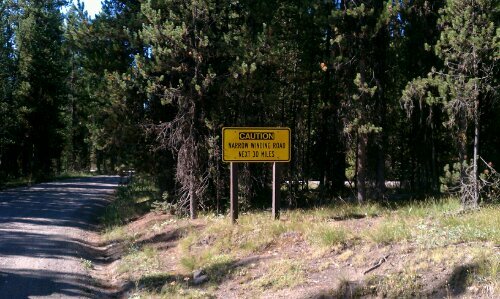 This is where things start to turn a bit… Riding along I see a sign for the “Medicine Wheel” 3 miles. I figure, hey, I’ve got time to kill, that may be neat, and it’s only 6 miles round trip….so I turn in on the gravel road and ride about 1.5 miles, when I come to a parking lot and a ranger station. I park and go to the station, read some of the information and talk to the ranger, who tells me it’s a 1.5 mile hike to the site. I figure since I’m already here I may as well go, and I didn’t want to just turn around and walk away at that point. Figured maybe an hour to go out, look, and come back…turns out it really was uphill both ways, and at nearly 10,000′ my out of shape self wasn’t making very good time. When I finally got there it was really interesting and in a really scenic location. Again, though, the lousy wildfires obscured the views in haze. I stayed there for a while talking to the ranger about the site, football, hockey, my trip, and a lunch recommendation, and made the long walk back to the parking lot. I think my total time was about 90 minutes, but it seemed like I was walking much more than that! Rode further on 14a and stopped at the Arrowhead Lodge for lunch based on the rangers suggestion. They seemed really busy, and it took an hour to get my bacon cheeseburger (rangers choice) (it was excellent). It was close to 1:30 when I left there, still having over 200 miles to my goal. After lunch the temperature had risen to about 88. I rode a bit more to Dayton, where I stopped for a Gatorade. While standing outside a local talked to me about where I was from, going, etc and suggested that I stay on 14 to Gillette instead of getting on 90 in Sheridan like I planned. I’d thought about it previously, so I thought it was a good idea. The temperature had risen to 93 now, and I’d ridden about 50 miles without stopping for a drink, there was nowhere. Finally I came up on Clearmont, where I removed my jacket shell, unpacked the Camelbak and filled it with water for the 70 miles with no services to Gillette. I doubt if I saw 10 cars on that stretch. It was interesting though. After getting to Gillette, I did get on 90 for a short sprint to Moorcroft, where I got on Wyoming 24 to Devil’s Tower. I arrived at about 6:15pm. What an unusual place! It’s truly a place that I enjoyed seeing. I knew I didn’t have the time today to walk it, so I drove around the park looking for a place to get a picture with my motorcycle and the tower. (I know, lame) I plan to go back tomorrow. After getting my picture, I was ready to be done. Made the short ride to Hulett, stopped at the Best Western, and here I am. It’s 2am, but I’m current on the blog. Goodnight. Getting ready on my own schedule seems weird after having a set schedule for the past several days. I slept a little later, had a leisurely breakfast, and lounged in the hotel lobby for a while, trying to get motivated. I still didn’t have a real plan for a route. I was sitting there looking at a map the hotel gives out when one of the other riders stopped by. We talked a bit and he mentioned a good road he’d ridden when going east in the past. Since I had no ideas of my own and it was generally the right direction I decided that was where I’d go. I spent quite a but of time trying to figure out how to get everything on the bike, since I had not yet had everything on there at once. After a couple of tries,i said my good-byes to the remaining riders and staff and took off around 10:30am. The route I chose would take me out of Helena going east on 287 to 205 along 90 to 90, then to 89 which took me into Yellowstone National Park. The park was jammed, probably since it was Sunday of Labor Day weekend, so I didn’t even try to see any of the big attractions. 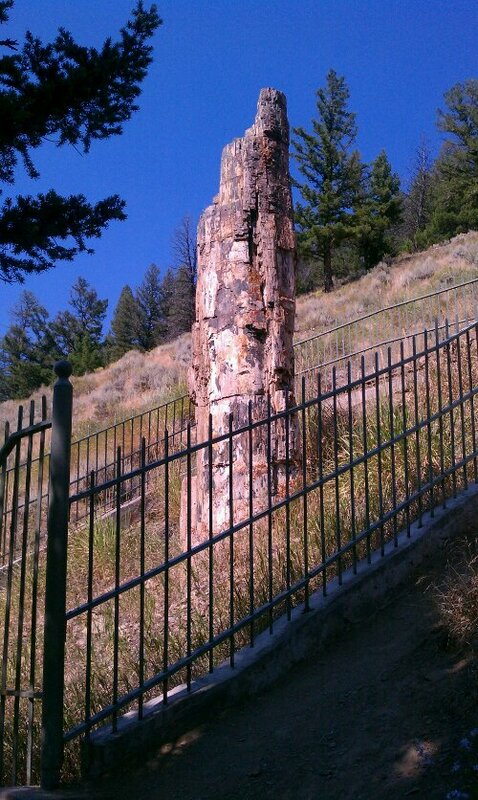 I did go by the petrified tree and got some pictures. A lot of the trees in that area of the park had been burned in previous wildfires. In fact, a fire was burning just to the north of that area when I was there, I could see the smoke in the distance. 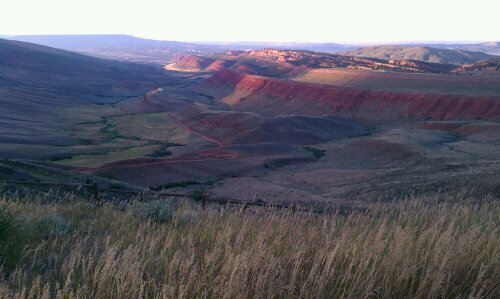 While in the park I did see antelope (which we did see bunches of on the ride), deer, and a bunch of bison (buffalo). I also saw a bear. I could tell that because of the absolute circus of human activity in the area. There was even a bus there! I just looked over and saw it as I made my way through the confusion. I followed the road around to the northeast entrance and exited the park there. I drove through Cooke City and Colter Pass, which is about 8000′ elevation. 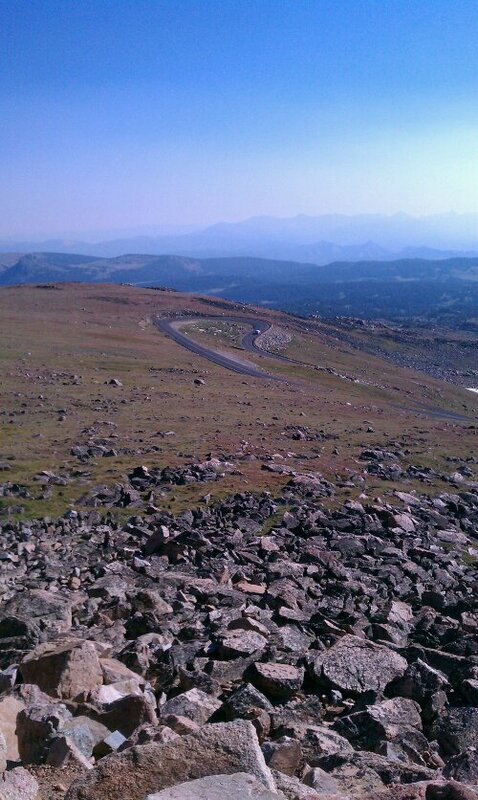 I then got on the Beartooth All American Road, which is the road I was told about earlier. Amazing. Incredible. There really aren’t enough words to truly describe what an interesting ride it was. A steep climb with lots of switchbacks, beautiful views, lots of turnouts, it was a really fun ride, even though I got caught up in traffic a lot and couldn’t really tear through it. (not that I would have, but I may have been able to go faster than I did…). If you ever get the chance, I’d give it a ride. 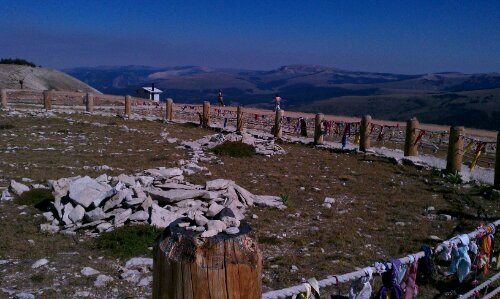 My goal was Red Lodge, Montana, and I got there at about 5:45pm. I got a restaurant recommendation from the desk clerk, got cleaned up and went to dinner at the Carbon County Steak House. I ordered the Bison. It was delicious. 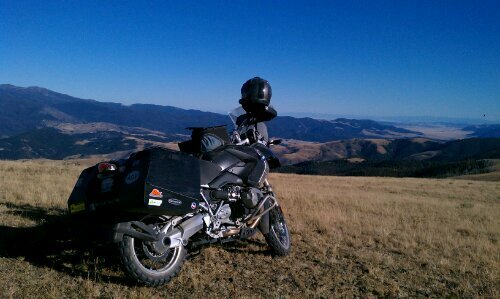 We awoke to the coldest temperatures we had seen so far… 33 degrees according to my motorcycle. Strangely, though, everything was dry with no frost. I guess it was just breezy enough or something; either way it was great to put away dry great for the trip home. The riding day started out with some decent gravel road riding leading to a fairly rugged climb up to Morrison Lake. On the way we had another minor incident; a bike was dropped causing a broken brake reservoir cap, which could have been a ride ender for that bike, but some judicious use of duct tape allowed that bike and rider to continue, though they missed the up-and-back to the lake. I need to look into a different cap or guard I guess. Just before we headed out to the lake the rider behind me in the line noticed his tire was low. He tried to fill it with his pump using his powerlet, but it wouldn’t work (pump pulled too many amps for the Canbus) Since I had all the equipment and connections to run the pump I was asked to help out, and I did, but that meant that I got shuffled to the back of the group as they took off while I was packing up the tools. The trip to the lake included 2 water crossings, a first for me and my GS. I wanted to change my GoPro camera mount to the waterproof mount, but since I was in the back of the group I only had time to remove it, so I didn’t get any video of the first crossing. I did get it mounted in the other housing for the return crossing, so maybe I got some good video, but I won’t know until I get home. We made a total of 4 crossings each, and nobody took a bath, which I think slightly disappointed our tour leader. The climb up was fairly difficult, but uneventful, and when we got to the top we had a nice view of the lake. I doubt many people will ever see that lake sure to it’s remoteness and difficulty in getting there, so seeing it was a real treat. After the lake section was done, we rode a really smooth, fast gravel road through a beautiful valley. There was a section of what I called “orange” gravel that was just perfect for traction that was a lot of fun to ride on. At one point in the valley a coyote ran across the road directly in front of me, close enough that I could see him clearly, but not so close that I’d hit him. He hopped the sagebrush on the side of the road and disappeared among the brush higher up the hill. We reached our final fuel stop after a short highway run, where we said goodbye to over half the group that wanted to get back sooner to prepare for their trips home. I had to drag out the tools and my pump again to help another rider with his tires, but got packed up quicker this time so I stayed near the front of the new, smaller group. The ride up on our last run was tremendous. The road conditions were smooth and fast, the turns though the trees were fun and spaced out such that you could get on the power a bit between them. The rider in front of me stopped near the top to take a photo, so I passed him and sped up a bit to make some space. As I passed the top of the hill and started to descend I thought, “that would have been a good place for us all to stop for photos”. Since I didn’t see anyone I kept going down the hill at a good pace, trying to catch up to the rider in front of me. I didn’t see any dust even, so I thought I was way behind was about to speed up more when I heard a horn behind me. I guess the group had turned from the road and stopped at the top, but nobody posted on the road to let me know, so Jim chased me for about a half-mile to stop me. Oops! 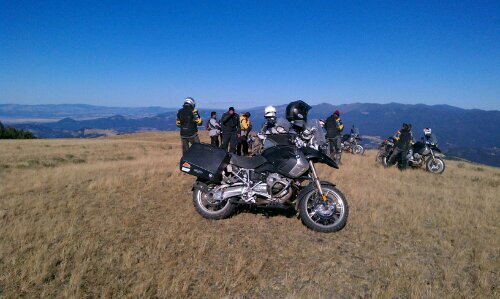 We stayed at the top for a while, taking pictures and thinking about what the other riders had missed. We then started down. I think the descent was the most challenging riding we did on the whole ride. It was steep, rutted and covered with loose rocks. We all managed to keep in control and made it down without incident! We made one last short run through a narrow, stone covered track to get to an abandoned train tunnel that was over a mile long. I walked in a bit as one of the guides rode a way in. The GS sounded really cool in the tunnel. After the tunnel, a short bit of gravel more and we hit the pavement. That was it, the ride was done. I was happy to have finished it, but was saddened that it was over at the same time. We did the usual wake up, coffee, pack, eat breakfast and riders meeting thing. It was going to be a 3-state day! 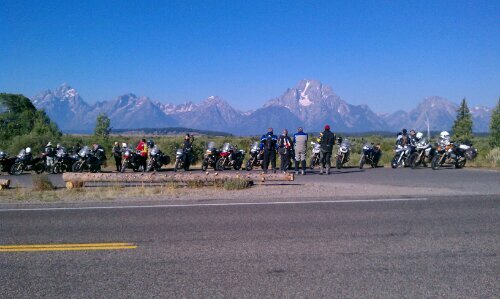 The day started with a quick road ride to Grand Teton National Park. The park really had some amazing scenery, but was a little obscured by some haze caused by some nearby wildfires. Today the riding was dusty. REALLY dusty. We really spread out the space between everyone today to try to maintain some visibility. It looked neat to see a huge dust cloud following the riders off in the distance ahead our behind. We stopped for lunch next to Warm Water Creek which had a small deck over a stream filed with trout. There were so many that any food that you tossed into the water was gone in seconds. It was pretty neat to watch the fish as they just held their place in the fast moving water, then moved to the food and went right back where they were. We crossed into Idaho for a bit, then moved into Montana. We ran through a long stretch of really deep gravel that was a lot like riding in sand. I was definitely glad for my training in this section! 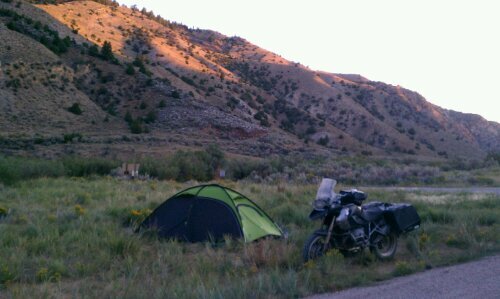 We set up camp somewhere in Montana, but iI’m not really sure where! The video crew was trying to get some footage for the beer commercial that they were shooting. I guess the beer was warm, which caused some foaming issues (beer out the nose) for someone, and people were just being generally funny during the attempts to get some “testimonial” footage around the campfire. I hope some of that footage makes it to an outtake reel if out doesn’t make the DVD. After a great nights sleep in my cabin, we did the normal routine of packing up everything, getting breakfast (scrambled eggs with salsa, potatos, and bacon) and having our daily rider meeting. Our first stop was on the outskirts of Atlantic City, an abandoned mine. We poked around for a while in the old buildings, grabbed some pictures and continued out of town. We split the group into 2 smaller groups, guys that wanted to go faster and the ones that would rather go a bit slower and more leisurely. I think this really helped the stress that was building up in this group, it made for a much smoother day. I chose to ride the slower group. Toward the end of the ride we encountered some large road construction project. What was unusual is that we were guide through by a “pilot vehicle”. Traffic was one way only, being stopped at each end alternating. I thought the guide vehicle was unnecessary, I think we could have found our way through. We did this 2 different times, so I guess that must be fairly normal here. We stayed at the Hatchet Resort. Kind of a rustic log motel I guess. Day 5 sounded good. A plan had been made the day before, we were to meet an “interesting individual” somewhere and he was going to show us a cool route. We just had to get there, which, unfortunately, most of us didn’t. Our ride started with the now normal short highway ride to the trail, followed by our first dirt segment of the day. It was a pretty nice gravel road, but it was really loose gravel with some tight turns. One of the guys in the group got a little too wide on one of them, dropped off a pretty high shoulder, had it almost saved except for a bush that caught the bike and tossed him off. A broken collarbone and about an hour and a half later we continued on, down one fellow rider. Unfortunately, the mishaps weren’t done, and the second one happened fairly quickly after the first. Another tricky corner, too much speed and a tree resulted in a smashed up GS, but the rider was ok, just a little scraped up. 2 hours or so later, some JB Weld, and the bike fired right up, looking a bit worse for it. The mirrors were gone, the black plastic gas tank shield, the stainless guard were all messed up, and the valve cover was broken with about 4 small pieces that were glued back in with the JB Weld. Our guide Keith got to ride it out with pretty bent up handlebars, but it seemed to do ok.
Because of the time and incidents it was decided that the entire group would never make it to the rendezvous, so a lottery was quickly held among those interested in making the high speed trip to make it there, while the rest of us made a long highway trek to our lodging for the night. 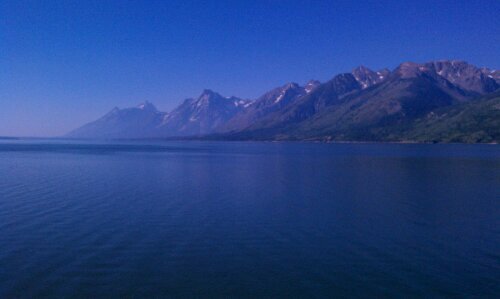 We still saw some pretty amazing scenery though! After a long, windy trip we made it to the bed and breakfast we were staying at, the Miner’s Delight Inn. What a cool place! 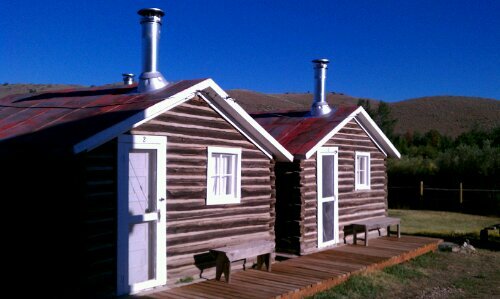 There were 6 or so small cabins and some rooms in the main house, but not enough beds for everyone. After another lottery, I was a lucky winner of a cabin! No tent for me! The place had a nice bar with an extensive collection of single-malt scotch whiskys, which I didn’t try since I know nothing about them, and some were quite expensive. It also had a really nice old piano, with which John, the guide we were supposed to meet up with, played amazingly! I stayed up way too long listening to him play and got to talk to him a bit during dinner. Really cool guy, and a great end to what was a disappointing day otherwise. 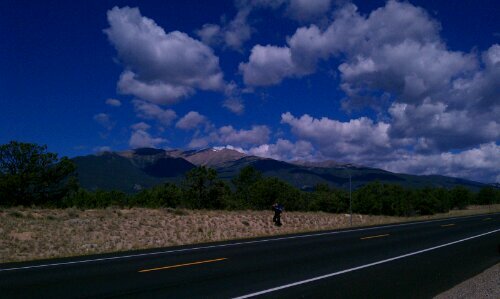 It’s actually my 4th day on the divide ride today. It’s been several weeks since my day 1 update since on days 2 and 3 we had no cell service where we camped. I’m just going to fill out day 4, and fill out days 2 and 3 later. So, day 4. Actually, day 3.5. 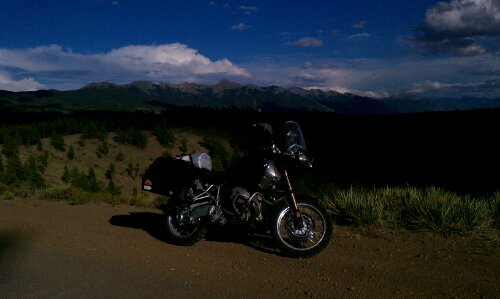 After leaving my first attempt at making this ride and leaving my motorcycle in Denver, yesterday I flew to Denver, picked up my bike, and rode it to Marshall Pass, where I met up with the current tour group. I got from Denver to Marshall Pass by following US 285, which, for just being a regular old highway, really had some pretty amazing scenery along it! I followed my backtrack from when I’d left and had no problem finding the campsite, so all my worrying about it was needless. After arriving and getting my campsite set up, the tour group arrived, I introduced myself around a bit, dinner was served and we sat around the campfire for a bit before bed. After I went to bed I felt sick, just as I had in a previous update that I haven’t written yet. I’m not sure if it’s the altitude or not, but last time it was just the one time, so I’m hopeful this will have a similar outcome. So, as a result, I didn’t get much sleep. It also rained a bit, which is always nice when tent camping. There was some pretty cool wind gusts right before the rain came, I heard 3 distinct gusts blowing through the trees above our campsite before it made it to the tent. It was strong enough to make me worried about my lack of staking down the tent, but nothing happened. So finally, day 4 ride report! We got up, packed away all the wet gear, had some breakfast, had our rider meeting, and hit the road! Our route took us down the mountain the opposite way I’d come in the day before, and we rode a good bit of the 285. 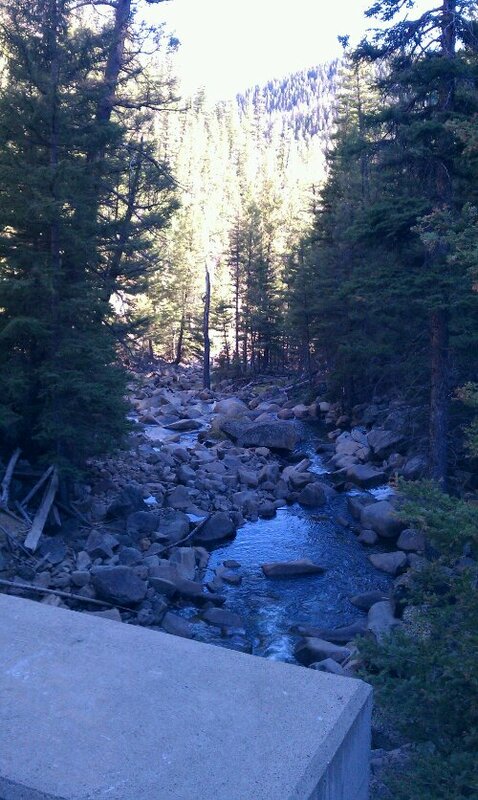 Todays ride was through 3 different passes; Marshall Pass, Boreas Pass, and Rabbit Ears Pass. 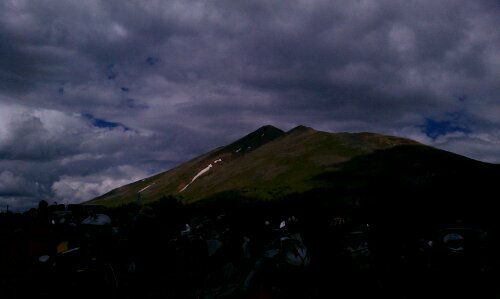 We also rode through Breckenridge, which looked like it would been a great place to spend more time. It was pretty easy riding today, with a couple of more challenging boulder (?) sections to keep it interesting. We’ve stopped for the night at the	Rabbit Ears motel in Steamboat Springs. I took some pictures with my cell phone, most of which didn’t come out because I messed up the settings, but hopefully I can fix them later. I’ll also have to fix the post display so they look nice, but this time I only brought my phone to save some space.